In this February 14, 2019 photo, Colton Welch, a junior at the State University of New York at Morrisville, New York, tends hydroponic tomato plants which will provide students with data applicable to cannabis cultivation. College student Grace DeNoya is used to people laughing when they learn what she is studying. Her degree centers on the marijuana plant — an intoxicating drug that is illegal in many parts of the world. “I say, ‘No, it’s a serious degree, a chemistry degree first and foremost. It’s hard work. Organic chemistry is a bear,” the 27 year old told the Associated Press. DeNoya is one of the first students in a new four-year degree program in medicinal plant chemistry at Northern Michigan University in Marquette, Michigan. The school, known as NMU, is one of an increasing number of colleges and universities that are preparing graduates for careers growing, researching and selling the plants. Schools are answering changes related to the legalization of marijuana in the United States. It is legal for medical purposes in 33 states, and for non-medical use in 10. Lawmakers in other states are considering making marijuana legal. At the same time, industries supporting legal marijuana are expanding across North America. As a result, research shows the future is bright for all kinds of careers in cannabis – the family of plants that includes marijuana and its non-drug relative, hemp. Jobs include growers and store operators, and even producers of cannabis-based foods. People can also work as sales specialists, laboratory directors and pharmaceutical researchers. Arcview Market Research reports on the cannabis industry. The organization estimates the industry will support 467,000 jobs by 2022. 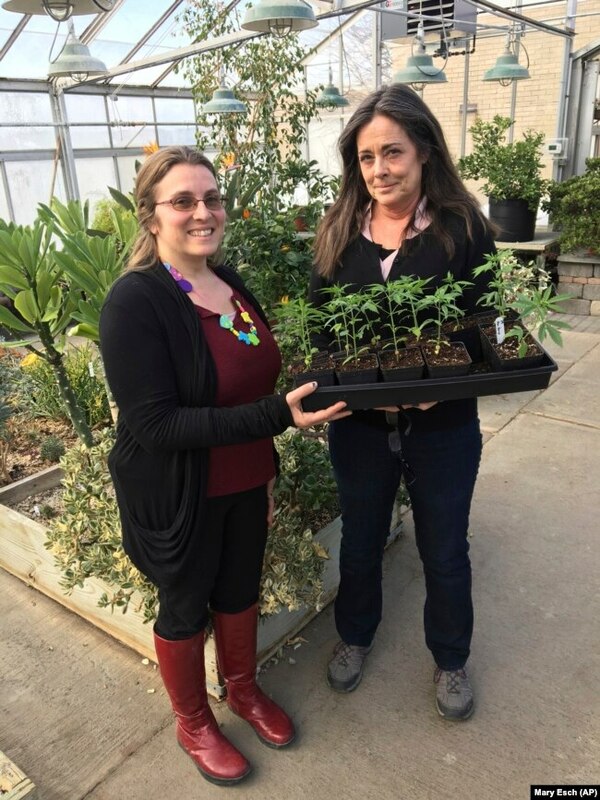 In this February 14, 2019 photo, Jennifer Gilbert Jenkins, left, assistant professor of agriculture at State University of New York, Morrisville, and Kelly Hennigan, who is author of the cannabis minor and chair of the Horticulture Department. Brandon Canfield is a chemistry professor at NMU, where Grace DeNoya goes to school. Two years ago, he proposed a new degree program in medicinal plant chemistry. The idea came after he attended a cannabis industry conference. There, industry representatives spoke of an urgent need for chemists to produce quality tests for cannabis products. “We’re providing a fast track to get into the industry,” said Canfield. NMU’s four-year degree is the closest thing to a degree in marijuana at an accredited university in the United States. It has drawn nearly 300 students from 48 states, Canfield said. Students will not grow marijuana, which Michigan voters only recently legalized for non-medical use. But Canfield said students will learn to measure and produce medicinal substances from plants such as St. John’s Wort and ginseng. They can then use that knowledge with marijuana. A similar program is being launched at Minot State University in North Dakota this spring. The college said students will learn laboratory skills related to medical marijuana. NMU professor Brandon Canfield noted that students who study marijuana could find jobs paying $70,000 right out of school. Those wishing to start their own businesses can add classes in accounting, legal issues and marketing. In this February 14, 2019 photo, Jennifer Gilbert Jenkins, assistant professor at the State University of New York Morrisville displays some cannabis seeds at the university in Morrisville, New York. Colleges are creating many different offerings to answer the expected growth in cannabis-related jobs. Colorado State University offers a cannabis studies program centering on social, legal, political and health effects. Ohio State University, Harvard, the University of Denver and Vanderbilt University offer classes on marijuana policy and law. The University of California Los Angeles has launched a Cannabis Research Initiative. The school claims it is one of the first academic programs in the world centering on the study of cannabis. Researchers there are currently looking at issues such as medical treatments and economic effects. Agricultural schools are also getting in on the action. The University of Connecticut is launching a cannabis growing program this spring. Jennifer Gilbert Jenkins is an assistant professor at the State University of New York in Morrisville. The central New York school is launching a new program in cannabis studies this year. Students work with hemp and other plants rather than marijuana. But they can do internships at medical marijuana companies, Jenkins said. Colton Welch is an agriculture business student going through Morrisville’s cannabis program. He points out how many uses the plant has. 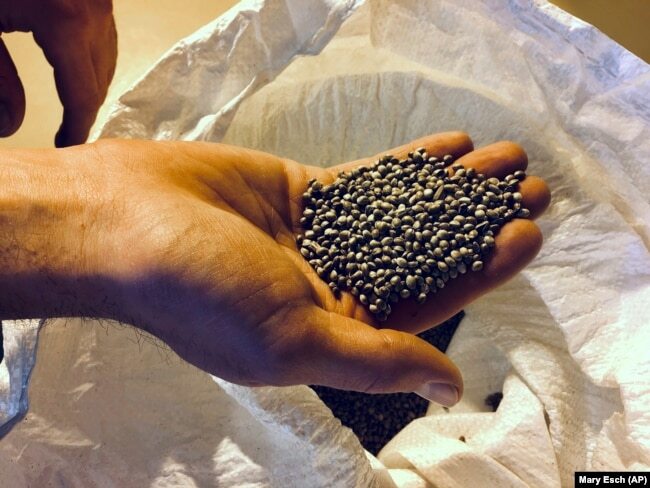 “I see a lot more farmers reaching out and trying to find people who know about this new crop,” he said. New York legislators are moving to legalize non-medical use of marijuana. The state’s first legal hemp production was collected in 2016 under a Morrisville research permit, which gave rise to the new cannabis program. Karson Humiston is the head of Vangst, an employment agency specializing in cannabis jobs. She said the future looks good for students in this area. Mary Esch reported on this story for the Associated Press. Pete Musto adapted it for VOA Learning English. Kelly Jean Kelly was the editor. We want to hear from you. How common is cannabis research at colleges and universities in your country? Write to us in the Comments Section.